More than three years after Shadowrun Online was revealed to the world, it finally has a release date, and a swanky new name, too. Developer Cliffhanger Productions said it decided earlier this year to change the title to Shadowrun Chronicles: Boston Lockdown in order to correct mistaken assumptions that the game is an MMO. Shadowrun Chronicles: Boston Lockdown is a tactical-RPG, separate and distinct from Harebrained Schemes' Shadowrun games, that pulled in more than $500,000 on Kickstarter in 2012. 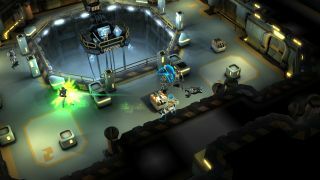 The original pitch stated that players could go at it entirely on their own, but the focus was clearly on multiplayer, a characteristic that was reflected by its title—a bit too much, as it turned out. "Shadowrun Online has always been a title that invited a wide range of expectations—some gamers thought it meant we are doing a full-blown MMORPG with a persistent open world, others believed it meant we are doing a free to play browser title," Cliffhanger Managing Director Jan Wagner explained. "The core vision of the game has always focused on experiencing the world of Shadowrun together with your friends and meeting other players, swapping stories and exchanging strategies as well as a creating a space for actual role-playing with others. This to us is the core experience of Pen and paper roleplaying—a shared imagination and story experience." There are multiplayer options, including co-operative play for up to four people and a "live multiplayer hub" with PvP matches, but the campaign is designed to work just as well as a solo experience. Wagner said the new title also reflects Cliffhanger's intent to release more content "evolving from the collective actions of our players" down the road. "They will shape the way the future plot of Shadowrun develops, literally making history in the Shadowrun Universe," she added. And, as promised, the release date: Shadowrun Chronicles: Boston Lockdown, which is actually already available as an Early Access title on Steam, will go into full release on April 28. Get the details at Shadowrun.com.